The Value of Fasting (from Anything). And How to Get Started. Have been trying this in various forms since around the beginning of this year. Thus far I’ve had success with abstaining from alcohol for almost 100 days, and intermittent fasting off and on. Haven’t had anything stick, but it does feel good to know that sometimes you can maintain some of that old self control… at least for a while. 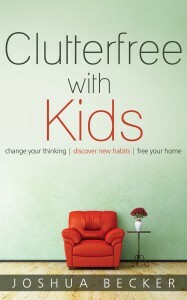 A few weeks ago I was honored to receive an advanced copy of “Clutterfree with Kids” by Joshua Becker for review. One of the things I appreciate most about Joshua’s writing and articles is that he’s what I consider a “normal” minimalist in that he owns a house, has kids, and has a job. In other words, he’s just like you and me – only he and his family have chosen to live a life of less so that they may appreciate it more. Even better, he rightfully acknowledges that everyone’s brand of minimalism is different. Regarding the book, I’ll say that if you’ve read one book on minimalism you’ve read them all and this is not a huge exception to the rule, but if you have not this is a great place to start if you consider yourself to be a “normal” person and are interested in how living a life of less can give you more. I think the key if you’re married is that you have to get your spouse on-board. Otherwise, don’t expect to have a truly “clutterfree” life (not that it’s really even possible with kids). I think the most you can really hope for is a more organized chaos. Making intentional choices like limiting TV or Internet time. Choosing to eat together as a family. Choosing your activities more deliberately. Choosing to travel with less so that you experience more. Start with small victories. Don’t tackle the hard things first. Owning less allows us to own higher quality items. Less is different than none. There is more joy to be found in owning less then can ever be found in organizing more. Organizing more never addresses the underlying problem. It is far better to de-own than to declutter. Intentionally or unintentionally we are all minimizing something. Gift giving: take time to let the fads show themselves then purge without concern. Conversely don’t force your ideas on others. Compare downward – many people with less “stuff” are actually happier. Bottom line, for a couple bucks and a few hours of your time, there are much worse things you could be doing, and on the bright side, it just may change your life. Can’t go wrong with that. PS: Thanks again Joshua for allowing me to preview the book. I read every word, and it was a good refresher. Interesting so far. Anyone else out there read it? Thoughts?